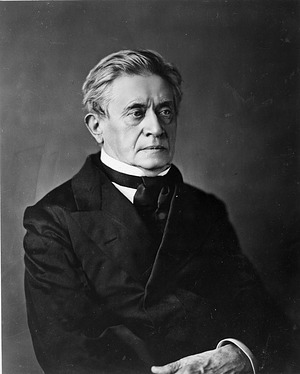 Joseph Henry's election as the Smithsonian's first Secretary in 1846 helped usher in a new era of science in the United States. The institutional framework provided by the Smithsonian was shaped by Henry's commitment to basic research and his support of projects too expensive for smaller scientific societies to undertake. 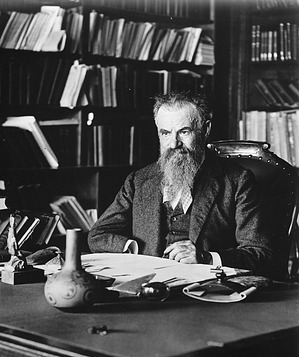 The evolution of anthropology during Henry's era exemplifies the Smithsonian's role in nurturing and professionalizing American science. One of Joseph Henry's first acts as Secretary was to accept for publication a major study on the "moundbuilders" of the Mississippi Valley. Vast numbers of abandoned mounds and earthworks dotted the Ohio and Mississippi Valleys at this time, yet little was understood about the people who built them, and there was much baseless florid speculation. In a letter to Coast Survey Superintendent Alexander Dallas Bache, a close friend, Henry predicted this study would be well-received due to popular interest in the topic, as well as "the intrinsic merit of the work as an example of cautious inductive research; . . . the fact that it could not be otherwise published," and because it would "tend to dissipate the idea that our aim is confined to . . . physical science." Henry believed the study was a wise choice for the inaugural volume of the refereed series of scholarly monographs he titled Smithsonian Contributions to Knowledge. While Henry took great care to discourage any taint of bias in the works he published, he was wary of presenting work that conflicted with the Bible. "While on the one hand I think the ethnological investigations should be conducted on grounds independent of revelation, on the other, great caution should be used," Henry wrote to the archaeologist Samuel F. Haven in 1856. Haven was close to completing a survey of American archaeology and ethnology for the eighth volume of Smithsonian Contributions, an important work that Henry feared gave too much attention to the theory that native North Americans were a distinct race and did not descend from Adam and Eve. In addition to descriptions of the physical evidence of ancient cultures, Joseph Henry supported the study of American Indian languages. His publication of works such as Grammar and Dictionary of the Dakota Language, by missionary Stephen Riggs, demonstrated his belief that language was key to understanding the origins and history of North American natives. Henry also hired ethnologist George Gibbs to produce a circular containing 211 words in four languages with blank forms for recording additional vocabulary. Henry had earlier helped distribute instructions and vocabulary lists produced by Henry Rowe Schoolcraft to missionaries, government agents, and soldiers.3In 1849, Henry urged the Secretary of the Interior to support Schoolcraft's compilation of what would become the monumental six-volume Historical and Statistical Information Respecting the History, Condition, and Prospects of the Indian Tribes of the United States. "The learned world looks to our country for a full account of the race that we have disposessed [sic]," wrote Henry," and . . . every year renders the task more difficult." 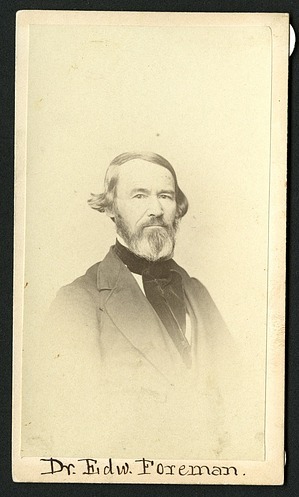 An 1864 Smithsonian lecture series given by William Dwight Whitney of Yale University was the basis for the first major American textbook on linguistics. Although Henry saw the support and dissemination of basic scientific research—versus serving as a public museum—as the Smithsonian's overriding mission, he recognized the Institution's anthropology collections as a valuable tool for public education. Prior to a major fire at the Smithsonian Building in 1865, a series of portraits of American Indians by John Mix Stanley hung on display. George Catlin's Indian portraits, painted during his travels west of the Mississippi in the 1830s, were mounted in 1872.8 "Since . . . we are . . . obliged to support a museum," Henry wrote to Smithsonian regent Louis Agassiz in 1863, Henry believed the museum's "specimens of ethnology" should represent all of North America. He had therefore hired someone recommended by Agassiz to make molds of Mexican materials in a collection the Smithsonian did not own. A widely distributed circular Henry issued in 1878, calling on people across the country to submit information on Indian mounds and other features of archaeological significance, spawned greater public awareness of archaeology.9 The circular was authored by Otis T. Mason, a Smithsonian ethnologist whose article on Germany's Leipsic Museum of Ethnology for the Smithsonian's 1873 annual report would greatly influence the organization of the US National Museum.10 When the National Museum's new building opened in 1881, the anthropology collections occupied more than 150 display cases. 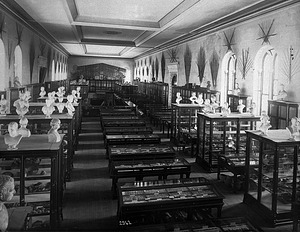 The archaeology collections were classified by curator Charles Rau, whom Henry had originally hired to prepare the Smithsonian's ethnology exhibit for the 1876 Centennial Exhibition in Philadelphia, as the collections were gradually organized. Powell drew heavily upon the work of his predecessors. His 1877 field guide, Introduction to the Study of Indian Languages, was an expanded version of George Gibbs's 1865 circular for the Smithsonian.13 In 1880, he issued a second edition that included Lewis Henry Morgan's kinship charts and was organized with reference to Morgan's work. Morgan's influence also shaped the theoretical framework that guided the Bureau of American Ethnology,14 which Powell led until his death in 1902. 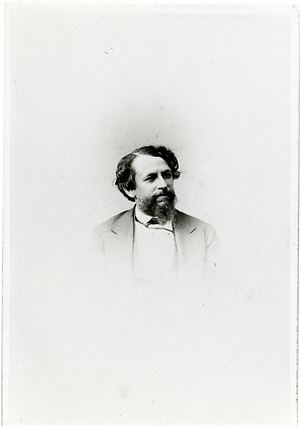 In 1879, less than a year after Joseph Henry's death, the Anthropological Society of Washington was organized at a meeting held at the Smithsonian and attended by Smithsonian Secretary Spencer Fullerton Baird and Assistant Secretary George Brown Goode.15 Largely organized by Otis T. Mason, who had become an American ethnologist for the Smithsonian under Henry's tenure seven years earlier, this organization later began publishing the well-regarded American Anthropologist journal and was the predecessor to the American Anthropological Association.16 The professionalization of anthropology by the end of Joseph Henry's tenure at the Smithsonian is also marked by the 1879 establishment of the Archaeological Institute of America17 and the election of anthropologist Lewis Henry Morgan to lead the American Association for the Advancement of Science, which also took place in 1879.18 Henry provided the institutional support essential for early of ethnology and archaeology which helped set the stage for the professionalization of the fields in the late 19th century. Repatriation Office, National Museum of the American Indian, 2012. Repatriation Office, Department of Anthropology, National Museum of Natural History, September 6, 2011.